My recent, first trip to London presented me with two surprises: the reach, convenience, and frequency of the tube, and the volume of Londoners’ complaints about the reach, convenience, and frequency of the tube. This line of thinking never occurred to me in my years growing up just outside Seattle, a city which I frequented but never gave much thought. 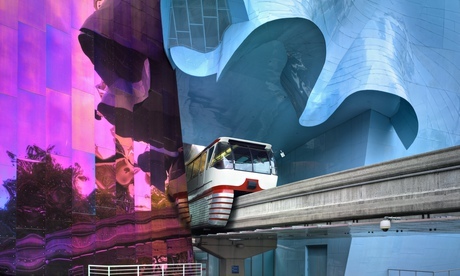 Seattle’s “retro-futuristic” image has, for the past half century, rested in large part on a pair of structures built for its 1962 World’s Fair: the globally recognisable Space Needle, and the lesser-known but still sadly evocative monorail. While neither offer much of everyday value to the locals, the monorail – which takes the form but, in running back and forth on only a mile of track, not the function of a dedicated public transit system – stands as a reminder of the city’s many frustrated attempts at complete urbanisation. Proposals for a useful monorail network have risen and fallen over the years; the first light rail line there opened only in 2009. This was written by Colin Marshall. Posted on Monday, February 17, 2014, at 8:37 am. Filed under Los Angeles, Manila, Mexico, Osaka, Seattle, Seoul, Tokyo. Bookmark the permalink. Follow comments here with the RSS feed. Post a comment or leave a trackback.